FILE - High-efficiency LED light bulb "E-CORE", shown at the 17th Toshiba Group Environmental Exhibition in Tokyo. A street light retrofit is expected to lead to a significant conservation of energy in India and reduce its carbon footprint. In India, a program to equip millions of homes with energy efficient bulbs and undertake a street light retrofit is expected to lead to a significant conservation of energy in the power-starved country and reduce its carbon footprint. A year ago, Harsh Singh, who lives in a low income neighborhood in New Delhi, was given two LED (light emitting diode) lamps by the state-owned power company for about 10 cents each. He paid another 20 cents every month for a year in his electricity bill. His investment has paid off. “My monthly bills have come down by about Rs 100 ($1.5). And the children are also happy because they get bright light,” said Singh. Delhi is among 10 states where the government has distributed more than 70 million LED bulbs in the past year. The target is much more ambitious; by 2018, the government wants to switch 750 million household bulbs and 35 million streetlights across the country to LEDs. The rapid shift in India has become possible by putting these lights, whose price tag in the market is 10 times higher than incandescent bulbs, within reach of consumers like Harsh Singh by allowing them to pay in easy installments. A dramatic drop of nearly 75 percent in prices in the past year has given further momentum to the program. Saurabh Kumar, head of state-owned Energy Efficiency Services Ltd, which is spearheading the program, attributes this to bulk purchases by the government. “A virtuous cycle started happening. When we started the program two years ago, the delivered price was Rs. 310 ($4.5) for a seven watt LED bulb. Last month the prices have come down to Rs. 64 ($1),” said Kumar. FILE - A light-emitting diode (LED) street lamp is illuminated in Langen, Lower Saxony. 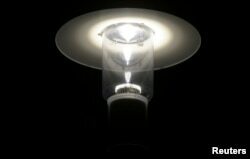 Experts say LED is not just environment-friendly; it helps consumers save money and enables the government to fill energy gaps. In making the switch to LED technology, India is emulating countries like China and Japan. The Climate Group, a non-profit that advocates cleaner technologies, says LED is not just environment-friendly, it helps consumers save money and enables the government to fill energy gaps. “It is a win-win-win situation, it is a triple win. So it’s a non-brainer when it comes to seeing that LED makes an absolute case for rapid transition, rapid scale up in a country like India or anywhere in the world for that matter,” said Krishnan Pallassana, India director of The Climate Group. India estimates the energy savings in the past year add up to about 2,000 megawatts, or enough electricity to light up the small Himalayan state of Himachal Pradesh. The government hopes to scale that up 10 times in the next two years, saving $6 billion every year. The conservation is a boon for a country beset with chronic power shortages – in hot summer months, cities and villages routinely plunge into darkness. The southern state of Andhra Pradesh, which is at the front-lines of India’s LED push, is already reaping the benefits. Here, virtually every household has been handed two LED bulbs in the past year and street lights across cities glow with the same white light. Ajay Jain, secretary of the State Energy Conservation Mission in Andhra Pradesh, said the switch to LED has reduced demand in peak evening hours when power outages were the worst. The savings in electricity bills is also a boon for local civic bodies. “Forty percent of the money used to go for electricity bills. Now they are able to spend on development activities, for citizens - roads, drainage or water supplies,” said Jain. After household and street lights, the government is turning its attention to selling energy efficient fans and agricultural pumps to consumers. As with bulbs, the key will be to slash costs through bulk purchases. However, the push with energy efficient technologies into rural areas and smaller towns will encounter challenges, warned Pallassana of The Climate Group. He said the infrastructure to install LED is not adequate in many places and needs upgrades. “The awareness and technical understanding if you particularly go to some of the interior towns and cities of India. It is lacking at this point of time and we need to raise that awareness and technical capacity at that level,” he said. Still, energy economists have welcomed the beginning. Along with cleaner energy such as solar, they say the switch to LED will play a key role in enabling the world’s third largest polluter meet its goal of reducing its carbon footprint. That is not going to be easy in a country that needs to massively scale up its power generation to bring electricity to the 40 percent of its population still not connected to the grid. “The savings will be around 100 billion units (of electricity) ever year, and most importantly the carbon dioxide emissions will reduce by somewhere around 65 million tons every year,” said Kumar of EESL who is optimistic the program is going “faster” than anticipated.